Pansies are one of the most popular and recognizable cool weather annuals. There are many cultivars within the genus Viola, and most of them are hybrids of the same handful of species, so there are a lot of similarities, and probably only a botanist really cares which is which. The gardener knows pansies as flowers with almost heart-shaped, overlapping petals in bright colors or bi-colors and often with face-like center markings. Breeding has produced pansies that are better able to stand up to the cold, but there hasn’t been much luck producing more heat tolerant varieties. Many pansies are bicolored, making them striking plants for their small size. Although delicate, they are surprisingly hardy. And like their cousins the violas and violets, the flowers are edible. Although technically pansies are hardy in USDA Zones 7 and higher, they are very short-lived as perennials, and many tend to deteriorate after their first year of bloom. Pansies are usually grown as annuals or biennials. However, they can self-seed. Compact, low growers, pansies are ideal for edging and for squeezing in between rock walls and paths, as long as they can be removed in summer. They’re a great choice for early and late season containers and complement spring flowering bulbs, flowering as the bulb foliage begins to fade. Most pansies don't get very tall and, if they do, they will flop or cascade a bit. Expect most varieties to reach a height of four to eight inches and to spread between eight and 12 inches. Traditional pansies will bloom from spring through early summer, with some repeat bloom in the fall. USDA Zones 7 and above can grow pansies throughout the winter, and there are newer varieties, like the ice pansy that are bred to withstand light snow. Pansies will bloom best in full sun to partial shade, but they will stay fresh looking and keep blooming longer if grown in partial shade. Although pansies are not fussy plants, they will grow best in loose, rich soil with a slightly acid pH (6.0 to 6.2). 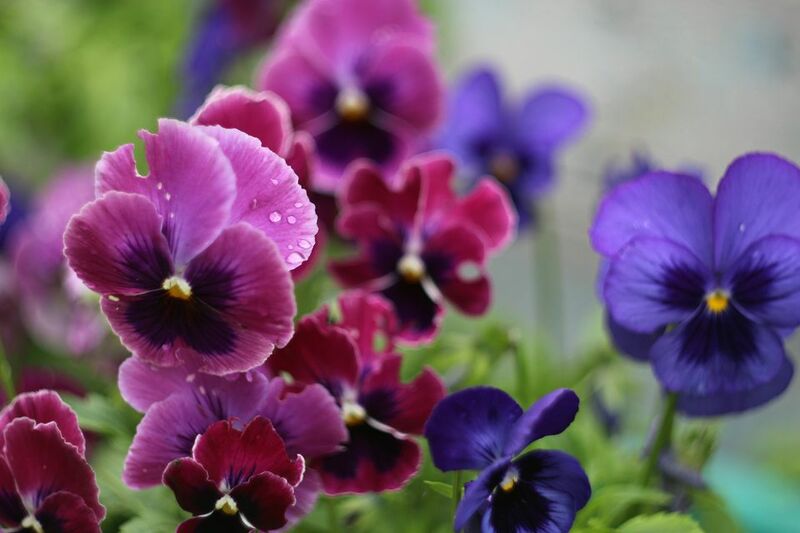 Regular watering will help them hang on a bit longer, but don’t expect your pansies to last all season. Pansies do not like heat at all and will begin to decline as the days warm up. As with any long blooming annual plant, pansies appreciate some fertilizer. However, too much food will just make them leggy. They respond well to monthly foliar feeding. If you like the variety of colors but still want a sense of cohesion, select plants from the same series. They’ll be similar in size and markings, regardless of the color. Pansies can be difficult to start from seed. They require temperatures around 60 degrees Fahrenheit and darkness to germinate. Covering the soil with black plastic will help germination, but the soil should be checked daily to make sure it doesn’t dry out under the plastic. Once the first shoots are visible, the plastic should be removed. Seeds generally germinate in one or two weeks but can take up to 15 weeks to bloom. If you can allow your pansy plants to remain in your garden and rest during the hottest months, they will probably begin blooming again in the fall. ​Shearing the plants back when they start to set seed will encourage new growth. Deadheading ​(cutting dead flowers off a healthy plant) will encourage more blooms. Slugs can be a nuisance during wet seasons, especially if growing in partial shade. Use a slug bait or thin out the planting, so it’s less damp. Occasionally aphids will attack pansies. Insecticidal soap should remove them. Use caution if you prefer to kill aphids with a strong blast of water since pansies are rather small and delicate.